Summary: The final reel, cutting from Bard to Gandalf to Bilbo and the dwarves to Tauriel and Legolas introduces one sub-plot too many. It’s very frustrating as there are other moments of real beauty and excitement. I have very mixed feelings; could do better. Another year, another trip to Middle Earth; this time, to the Desolation of Smaug. Bilbo Baggins (Freeman), now coming into his own, is still travelling with Thorin and company, having narrowly escaped the dungeons of the orcs. Saved by the skin-changer Bjorn, they journey on through Mirkwood, having lost the protection of the wizard Gandalf (McKellan), off on a mission of his own. They fend off giant spiders only to be arrested by the wood elves, whose snooty king Thranduil (Pace) has no love lost for dwarves. In perhaps the most exciting sequence in the film, Bilbo succeeds in freeing the dwarves from Thranduil’s dungeons, and they flee in barrels down the river, pursued by orcs and elves, meeting Bard (Luke Evans) who takes them to Laketown where they are welcomed as conquering heroes by the miserable townsfolk and their venal mayor (Fry), and encouraged to assault Smaug in the hope that the rivers with run gold again. Smaug (Cumberbatch) is, of course, the dragon that attacked the Lonely Mountain, driving Thorin (Armitage) and his merry dwarves into exile. He has created desolation; he’s not depressed, in case you were wondering; if anything, Smaug is very pleased with himself – Smaug the Smug, as it were. 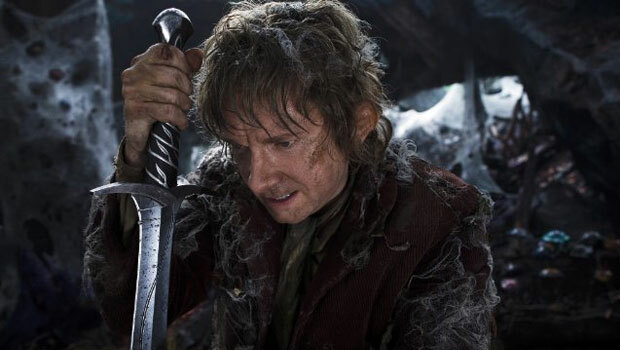 His initial encounter with Bilbo Baggins (Freeman) is a highlight of the film, as was Freeman’s interaction with Gollum in the first installment. Cumberbatch’s voice is delicious, his surprise at being attacked no less believable than his rage. Other sections are less successful. The decision to expand a slight, episodic children’s novel into a three film epic stretches the story to breaking point; additional characters, particularly the elf Tauriel (Lilly), try the patience, as does Orlando Bloom’s performance as Legolas, once again failing to exhibit anything recognizable as a human emotion. The inter-species love triangle between Legolas, Tauriel and Kili (Aidan Turner) is utterly unnecessary in a film that pushes a three-hour running time. I’m not sure what Tolkien would think of their delicate courtship (sample: ‘do you want to look in my trousers?’). It’s these impulses of Jackson (amped up action and crass disrespect for the text) that spoiled the film; there’s no let up, no pause for breath, no pause even for meals (Bilbo would definitely not approve!). The final reel, cutting from Bard to Gandalf to Bilbo and the dwarves to Tauriel and Legolas introduces one sub-plot too many. It’s very frustrating as there are other moments of real beauty and excitement. I have very mixed feelings; could do better.